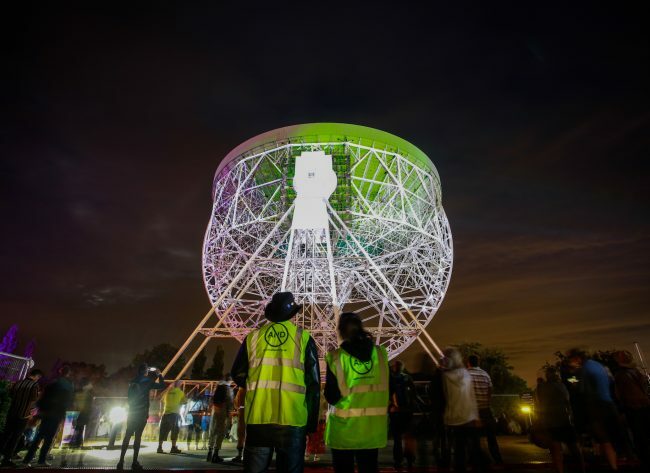 During the lead up to the bluedot festival, and during the festival weekend, our COSMOS Ambassadors engaged in a series of workshops and research trips out to Jodrell Bank in anticipation of Hidden in Plain Sight by COSMOS artist Addie Wagenknecht. The purpose of the programme was to give an insight into working in the digital arts sector, and provide a meaningful voluntary opportunity to ambassadors that were looking to start or enhance a career in the arts. We asked them what they thought of the work, and what they learned from working with AND, our COSMOS artist Addie Wagenkneckt at the University of Manchester researchers. Megan: Megan Evetts, full-time student of Illustration at Falmouth University. I enjoy reading, both fiction (especially sci-fi and fantasy) and philosophy / history; I also love motorcycling, hiking with my dog and surfing. Seth: My name is Seth and I am a student; starting an Art Foundation at Manchester Metropolitan University this September. I am aiming to do an Animation Degree the following year, as animation has always been at the centre of my interests for as long as I can remember. I have just finished my A Level Courses in Art, Maths and Psychology, and I also have a background in music and currently sing in Mellor Church Choir. Calum: Calum Smail. Director at The Round Group creative agency. Co-chair at the emerging Divergence art event. Stephen: My name is Stephen and I’m a filmmaker and technologist. Kath: My name is Kath Sage. I work for Cheshire East Council, in libraries, where my focus is primarily on promoting digital skills development, running a social inclusion, dementia-friendly book club and generally trying to alter the perception that libraries are ‘just books’. We are so much more! I am currently studying for an MSc in Digital Media Design with Edinburgh University. I also design my own jewellery and I plan to start my own design/jewellery business in the future. In my spare time, I love reading and hiking with my family, my friends, and my dog, Gromit. David: My name is Dave Lidster. By profession I am a teacher of 30 years although I have recently retired. Outside of the Ambassador Scheme, my hobbies are varied. I love the outdoors and like nothing more than to travel both within the UK and abroad. Also outdoors, I frequently occupy a tent and combine camping with walking, fly fishing or photography. At home, much of my time is engaged playing with Photoshop, Lightroom or administrating an art group in Facebook. There is usually an eclectic mix of music in the background. What did you hope to get out of the ambassador scheme before you started? Megan: I wanted to gain experience in working in the digital art industry and to begin to form contacts who might be able to give me work experience or assist in my artistic career beyond university. I was also eager to learn more about modern developments in digital art e.g. VR. Seth: I hoped to gain experience and make connections, as I understand both of these are vital to anyone with a profession in the artistic industry. As COSMOS was born out of collaboration through AND and Shift, as well as ARUP, I hoped the environment would allow for insight into many different sides of arranging events and pieces like COSMOS. 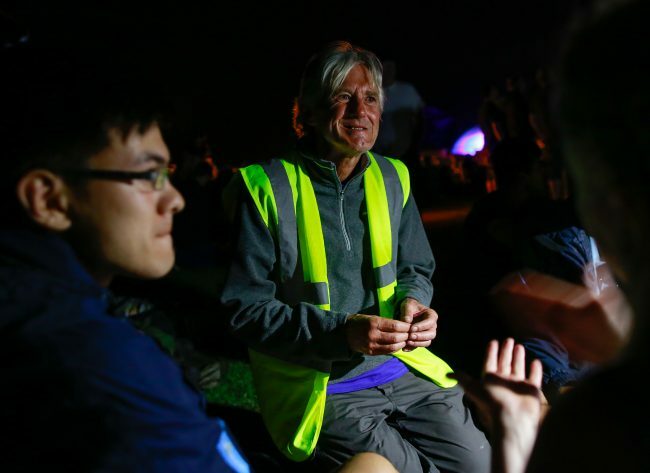 I attended bluedot Festival the year before and was excited to be able to contribute to the amazing experience and culture surrounding the festival. Calum: I entered 2018 knowing I wanted to create more artwork. I produce film, interactive productions and design for commercial and cultural organisations as part of my job, but I wanted to extend myself and get my artwork shown in public. To enable this, I needed to develop a deeper understanding of the art world, the processes involved in site specific and touring art, and to build links with peers, artists and organisations. The COSMOS Ambassadors scheme was perfect for this. Stephen: Networking with interesting people and getting inspired with new ideas. Kath: I enjoy learning about space and science. I am also interested in digital art and sound engineering. I was keen to know more about the process of combining these elements together. I used to create my own music and my own art, but real life unfortunately got in the way. I had hoped that joining the ambassador scheme would inspire me in some way to return to these aspects of my creative side. And it certainly has! I am so grateful to have had the opportunity to be involved in this scheme and I would not hesitate to take part again. David: My hopes with the Ambassador Scheme revolved round my being able to meet likeminded people and gain further insight into the industry with a view to future employment. It gave me the opportunity to build on my experience, over the last 15 months with ‘Colony’ by Mike Blow and Alison Ballard. This immersive piece has been presented to festivals and events throughout the country. What was your favourite part of the work when you saw it live? Megan: I loved the fact that both in the visuals and the soundscape it was possible to discern the data from pulsars in the ‘heartbeat’ of the piece. The soundscape and the visuals combined was greater than either piece in isolation as the slightly unnerving juxtaposition of the eerily calm sound and the overwhelmingly frantic visuals was incredibly effective; I thought this was a fantastic visualisation of space as both a vast expanse of nothingness and an arena for incredibly explosive cosmic events such as the death of a supergiant star. Seth: My favourite part of seeing the art live was the feeling it gave me of witnessing something from deep space and a connection with the heavenly bodies the piece was inspired and generated from. I feel like this effect was created out of the combination of the projections feeling cold, technological and almost as if they were simply and effect of some machinery, the swelling soundscape reminding me of what I would imagine deep space to sounds like (which I understand was exactly the artist’s intentions), and the sheer size and complexity of the project making me feel small and insignificant, a feeling usually connected with the idea of the universe. Calum: How the visuals and sound connected not only with each other, the telescope and the environment, but how they connected with the audience through an absorbing and immersive experience, was a joy to witness. Stephen: Seeing people just lie down and absorb it – some of them for 2 hours! Kath: Seeing the work live for the first time was breath-taking. We had previously only been able to listen to the audio on headphones whilst watching the projection, so we got to experience the soundscape live at the same time as the audience. It was mesmerising. I loved that the art was informed by the data collected by the Lovell telescope itself. The idea of art and science working together is so exciting! The way Addie used camouflage – hiding and then revealing parts of the telescope structure – was fascinating. It was as if the telescope was literally ‘hidden in plain sight’. Honestly, it’s hard to pick a favourite part. David: Apart from the awe-inspiring and mind-blowing nature of ‘Hidden in Plain Sight’ itself, during the live performance I particularly enjoyed sitting with small groups of people and communicating the meaning of the piece to them. The public’s reaction was invariably one of amazement and I found that satisfying even, if that was on Addie’s behalf, as she was otherwise engaged with the projection. The teamwork between Addie, AND, ARUP and the COSMOS Ambassadors etc made the live performance an effective success, giving the Public a memorable Scientific and Aesthetic experience. Working within the team, I found rewarding. Have you got any future plans inspired by the ambassadors scheme? Megan: The group is hoping to collaborate on a project inspired by the life cycle of pulsars which we hope to exhibit in a digital art exhibition in Alsager, which will hopefully tour (possibly with the ultimate aim of Bluedot 2019). On a personal level, I plan to learn more about the technologies involved in creating VR pieces and explore digital processes in my own artwork. Seth: I have already expressed interest in working with my fellow Cosmos ambassadors on work of their own, for instance Calum Smail has invited us all to collaborate on an art event in November and would love to contribute even a small amount to projects like these. As I am a student I have incredibly little experience creating projects and artwork outside of school, so to be involved in events such as this will be an amazing learning experience for me. Calum: Collectively we are creating an exhibition inspired by the COSMOS Ambassadors scheme and the training day with Abandon Normal Devices and Dr Sally Cooper at Jodrell Bank. We will be creating three to four main art pieces describing the creation of a pulsar, to be shown at the Divergence art event in Alsager on the 10th November 2018. Stephen: Yes. We’ve arranged as a group to collaborate on an art project for an event in November that Calum is curating. Looking further ahead I’m planning on exploring my abilities as a digital artist and excited about where that may lead me. Kath: Yes! The Ambassadors have all stayed in touch, which is nice. We left the COSMOS experience feeling very inspired. We are planning to collaborate on a digital arts event in Alsager in November. It’s exciting stuff! We all got on very well and share a passion for creativity and art (and cookie dough). David: As regards future plans, I would like to gain further experience and training and ultimately find permanent employment in the Digital Art sector. I look forward to working with organisations such as AND and SHIFT on future projects. Furthermore, as a result of the Ambassador Scheme, the team will be collaborating on a piece with a view to exhibiting in November and at events next year. What was your favourite part of the ambassadors scheme or what was the most interesting thing you learnt? 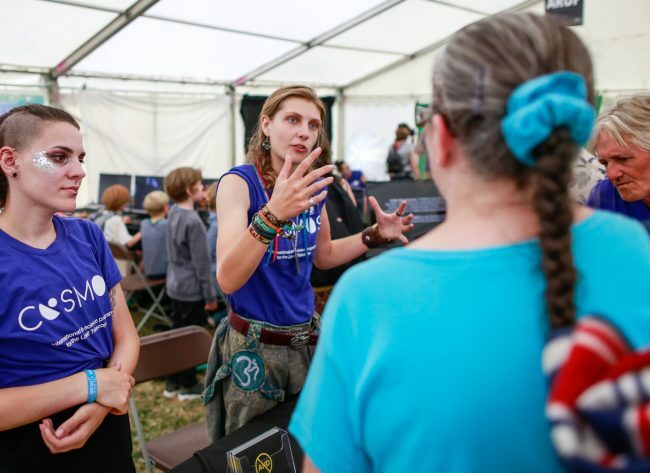 Megan: I have always been fascinated by astrophysics, and so I felt extremely privileged to have been able to chat to specialists in the field. I found gravitational lensing and colliding neutron stars particularly fascinating, as well as recent breakthroughs in quantum physics such as the detecting of gravitational waves which has only been accomplished in the last two years. I also very much enjoyed spending time with the other ambassadors; I am very much looking forward to collaborating with them in the future. Seth: My favourite part of the ambassador scheme was when members of the public would come to our stand and simply ask “tell me everything!” Over the training days and the days of the festival I had become passionate about the art and the context surrounding it, so when I could share my passion and inspire someone else it was exciting. The most interesting thing was listening to the artist Addie Wagenkecht speak on the “Art and Science” panel, as I felt it gave me a deeper insight into the work, and her approach to research and thinking behind creating gave me new ideas for my own work. Calum: Everyone involved made us feel completely welcome, so it was a pleasure being involved. I’ve learnt the art world is an area I want to be in more, and collaboration is key to producing top work and solving problems. Kath: I really enjoyed the session with Dr Sally Cooper from Jodrell Bank, learning about pulsars (and making our own!). The tour of Jodrell Bank was very special, too. I thoroughly enjoyed meeting Addie, the AND team, the engineers from ARUP, the people from SHIFT digital and colleagues from Cheshire East Council. My favourite part of the scheme overall was getting to know the other ambassadors and feeling like we were really part of an important process that showed people (literally) how digital art and science can work so well together and leave people feeling inspired. David: The whole scheme has proven to be a steep learning curve for me and a fantastic experience. I have met some wonderful people from all of the affiliated organisations as well as the team itself. The most important thing I have learned is that there is no reason why I cannot employ my transferrable teaching skills in an industry in which I have held a lifelong interest. I have a vision to take art such as this into schools and colleges at some time in the future. 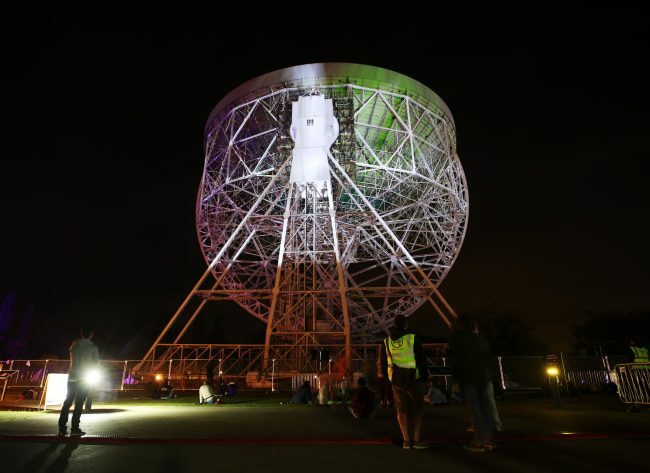 COSMOS is a flagship international artists commission and residency for Lovell Telescope. Produced by Abandon Normal Devices, commissioned by Jodrell Bank Observatory, SHIFT and Abandon Normal Devices. 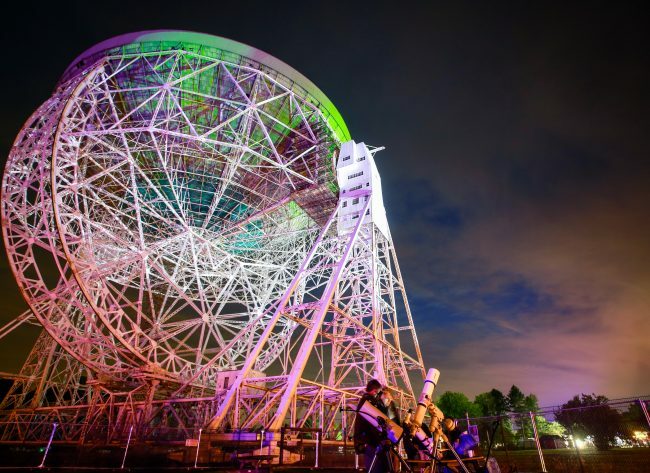 Supported by the University of Manchester, bluedot, Arup, Austrian Cultural Forum and with public funds from Arts Council England.